I've been actively buying back issue comics since, probably, around 1983/84. At the time, most comics were stored in simple plastic bags. The market had matured enough you could buy comic-specific bags by then, but they were fairly cheap plastic. 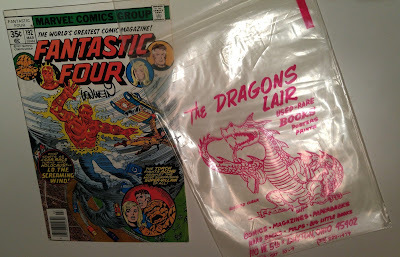 Mylars were available, but almost prohibitively expensive (meaning that the bags themselves often cost more than the comics that were put in them). The notion of having an acid-free bag wasn't really even considered. People eventually did start seeing their bags yellow with age, and realized it might affect the comic inside. Again, not a problem for mylars, but those weren't cheap. So the solution some people opted for -- assuming they just didn't keep the old bags around indefinitely -- was to simply replace the bags every few years. I think I recall hearing it was recommended to switch your bags every 4-5 years. In the past 30-some years, I have never seen another shop do this. Every comic you bought from Dragon's Lair came in a Dragon's Lair bag. This, I think, works better than a standard business card or flyer because not only do I have the shop's name and address, but I also know precisely which issue I bought from them. Even three decades later! I don't know how pricey these bags were, or how many got thrown out as collectors moved to better quality materials, but it strikes me as a great piece of marketing for the time. Probably not as successful today, as the back issue market has largely fallen by the wayside in favor of trade collections, but it's a genius idea for 1984! Did any other shops ever try this? This is a new one to me, and at the same time it does seem obvious once you see it. I have known stores that provide a bag with every comic sold, but nothing custom-printed like this. At most maybe a sticker or something; I think Carol & John's have their name printed on the price stickers of back issues. Printed backing boards would work the same way, too, as I think on it. Might be cheaper than getting custom printed bags. Daddy Jim's Comics in High Point NC had a custom made stamp that doubled as a business card for the shop. Every board was stamped and I mean every single one. Jim passed away some years back but I still run across a few of his boards when back issue shopping.